Looking for the ideal pressure gauge that works in the most adverse service conditions, even where vibration and pulsation exist? There’s no better time than now to discover the complete manometer pressure gauge range from HYDAC. The HYDAC range of manometers is also suitable for gaseous or liquid materials that will not obstruct the pressure system or attack copper alloy parts. HYDAC Test Gauge Kits offer accurate, precise and efficient pressure control and monitoring for your hydraulic system. Available with one, two or three gauges, they also eliminate the risk of introducing contamination. The kits are pre-packaged with quality HYDAC pressure gauges, adapters and test couplings. Their designs have to be precise as well as durable. A must have for every mobile service engineer, HYDAC Test Gauge Kits interchange with all competitor test point versions and are capable of pressure testing on any machine. 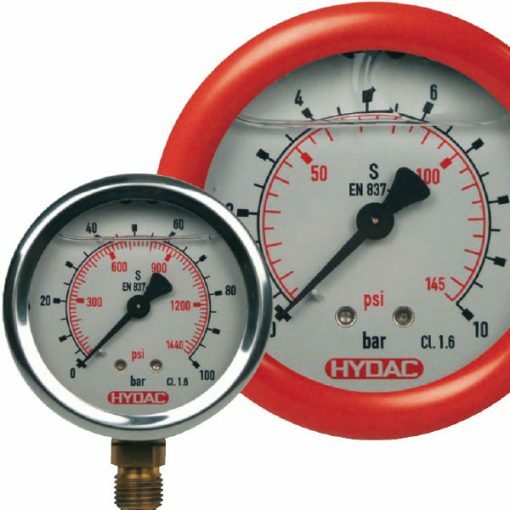 HYDAC can help you choose the pressure gauge that best suits your needs. Contact us today for additional assistance.